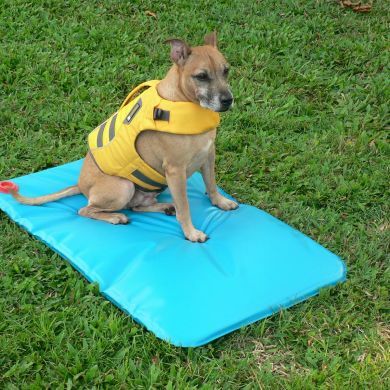 The Canine Cooler Thermoregulating Dog Bed helps your dog stay cool by reducing heat in the blood supply running close to the surface of the body. 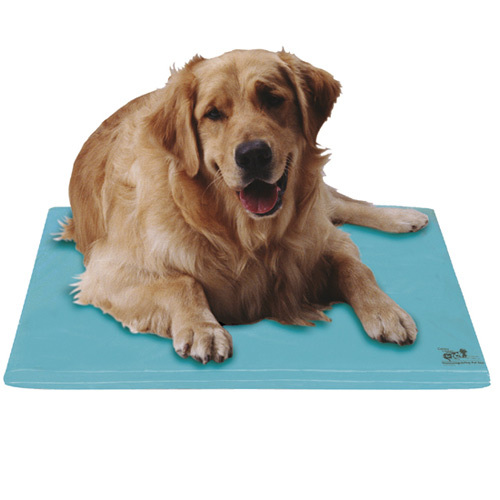 The soft, flexible bed has memory foam properties, making for a comfortable therapeutic dog bed. To activate it, just fill the bed with regular tap water. The water is then absorbed into the patented foam core. Once activated the Canine Cooler keeps on working without the need to refill, refrigerate or do anything. 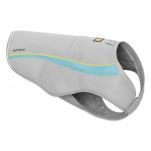 The Canine Cooler is soft, comfortable, allergy free and the flexible surface just wipes clean. The medical grade materials provide safety and durability. Unlike ice or gel packs, the Canine Cooler Dog Bed provides just the right amount of coolness to be effective and comfortable all the time. It does not melt or sweat so it can be used anywhere in your home or car without the fear of dampness. Rocky used it straight away ...infact he tried getting on it as i was placing ...thing is heavy enough as it is! I placed this in the spot where he used to sprawl out when the weather was hot (On the pavers under the outdoor table) ...somehow I imagine this being more comfortable, as it resembles a Gel pad. 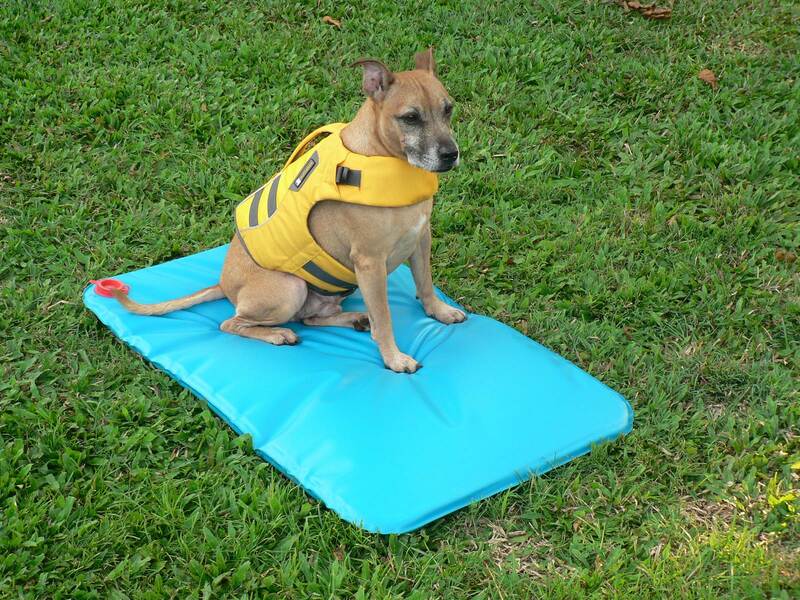 Read 8 customer reviews of Soothsoft Canine Cooler Pet Bed. The average customer rating is 4.8. Can't comment on longevity of the product as it's only a couple of weeks old. We initially purchased one bed for our convalescing Golden Retriever -Bosun , our other two Golden's would jealously sneak on it whenever they got the chance. Thankfully Father Christmas delivered another two beds to our household just recently. We live in a hot coastal country town, the beds are bliss for our animals, especially during the hot spells, our cats also "share" the beds with the dogs on the hot nights. I would highly recommend this product, its large & roomy enough for our fur kids to really stretch out & relax on, made from a good durable grade of quality rubber, I'm not worried about rips or tears. I also LOVE the fact I'm dealing with an Australian company, they were easy to contact, receptive to questions, and the delivery was quick & easy! My dog loves this bed in the summer to cool down while he sleeps. I use it indoors. Its a bit heavy to move around but apart from that it's a great product. I hope it lasts! Wow...the canine cooler is an awesome design. Thumbs up for stocking top quality products for our best mates. We've been having some sizzling hot days over the summer and this bed is almost always occupied during the day- if it's not my furry mates enjoying the cooling effects and memory foam comfort - us humans chill on the bed as well:) I'm very happy with this purchase, the large size is exeptionally ideal for my active German Shepherds who thrive on racing my horses and swimming @ the beach. As soon as they pipe down from their adventures they hit the cooler. This Bed is also very easy to keep clean...those owners out there that have muddy dog paws around the clock this bed is the go...wipe it down and it’s good as new. The bed is fantastic. I live in Perth Western Australia and we get heatwaves of 40 degrees C plus for days on end. My 14 year old bullmastiff loves the bed, she has moved on to it immediately I filled it up. She had another cooler bed which you soak in water and it was basically filled with water granues, that has been great, but unfortunatley because it allows the foor underneath it to get damp that makes the problem of her slipping when she gets up even greater. The canine cooler has amazingly non slip vinyl on the outside and she can get up from it with minimal effort. The only drawvack for me is the weight of the large size once filled with water. I have actually orderend a second one so that I can put one in each of her favourite places and now have to keeo moving them. Anyone with an old dog and hot weather - go for it. I am so impressed. Instructions were clear and the quality of the bed is great. I've placed it indoors and infront of the air con air flow and a window. It cools quickly and retains its coolness quite well. My golden retriever has already made good use of it and the large size is perfect for him. I already have one large bed for Pascal the Rascal my bedlington terrier and am now ordering another one for the bedroom as he tends to get hot most of the time. He just loves it and , in summer, spreads himself like a pancake on his magic bed. That stops all the panting and he looks like he is in seventh Heaven! It is important to lay the ( heavy when filled) bed on a paved( or tiled) area away from the sun of course or parquetry. I would not use it on carpet as it relies on the coolness underneath to work effectively. Yes it is heavy when filled with water but well worth it ..